The Cottage Children’s Medical Center Grotenhuis Pediatric Clinics is located in Goleta Valley Cottage Hospital's new Goleta Valley Medical Building, also designed by SWA Architects. Cottage Children’s Medical Center Grotenhuis Pediatric Clinics asked SWA Architects to conceive of a clinical space that would be suitable for toddlers, children, and teens, as well as the medical staff that worked there day-in and day-out. It was important to the staff of the pediatric clinic for SWA Architects to create a community-centric facility without leading itself to the stereotypically cartoony feel that usually decorates the interiors of pediatric facilities. Inspired by Goleta’s natural surroundings, the program for the Grotenhuis Pediatrics Clinics was organized into 5 distinct biomes: Oceans, Beaches, Forests, Mountains, and Meadows. “Rivers”, “Sand Dunes”, and “Vines” are built into the flooring pattern to guide visitors to the appropriate nurse stations and exam rooms throughout the entire pediatrics clinical facility. 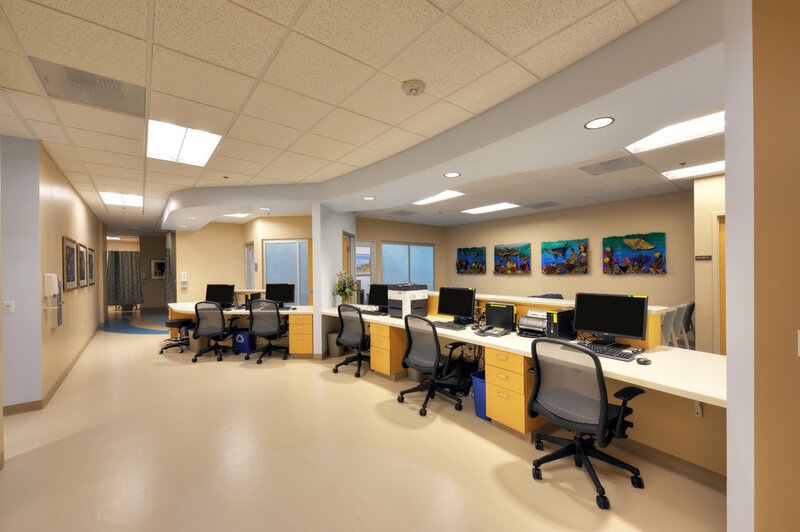 The Ocean area serves as the focal point of the pediatrics clinics, housing the main reception lobby & waiting area, general exam rooms, and the Pediatrics Gastrointestinal (GI) & Digestive Health department. Additional exam rooms are in located in the Beaches division, The Forest holds the Pediatric Oncology department and the Mountains hold the Pediatrics Orthopedics department. The Meadow is a special section which is devoted to the care and treatment of pediatrics patients with special needs, such as Autism. Additional care and consideration was taken to use muted colors and patterns in the Meadow in order to minimize any additional anxiety and emotional turmoil caused by bold+bright colors and patterns.